One of the questions we at Amphora are always asked these days concerns the impact Brexit is having and might have on the fine wine investment market. When you are investing in anything at all it is important to keep your emotions at bay, because nothing is more guaranteed to interfere with a coherent long-term strategy than a fit of high passion. The trouble with Brexit is that it seems impossible to hold a position on the subject with anything less than religious fervour! Ostensibly the reflex response points towards the currency markets. Fine wine is a luxury good whose secondary market is denominated in Sterling. 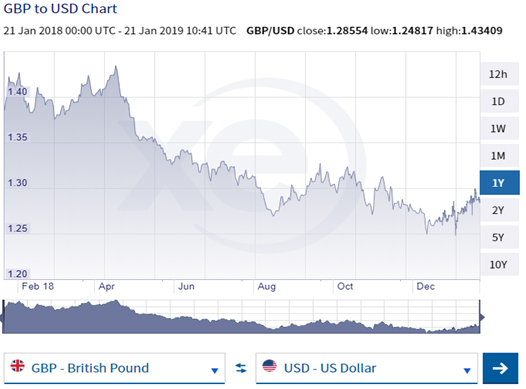 In the event of significant weakness in Sterling there ought to be a boost to prices which have either suddenly or gradually become cheaper for a foreign buyer. There are lots of foreign buyers of fine wine! 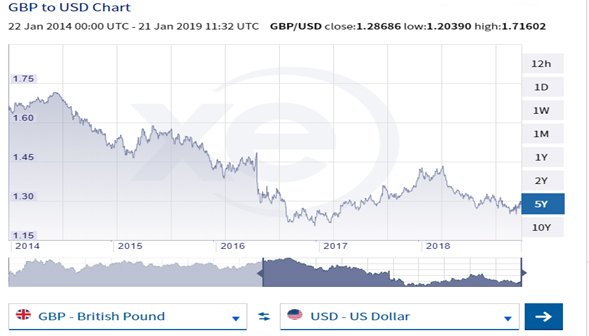 Sterling vs the USD traded within quite a wide range last year but the predominant move was clearly weakening towards the summer after a reasonably firm opening. 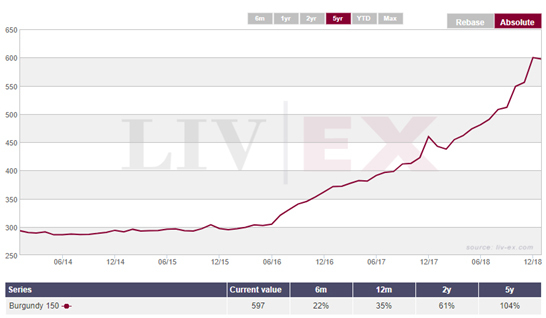 So far so good in translation into the fine wine market, but then the correlation softens markedly in the second half of the year. There are moves which you could attribute to correlation but you would have to be looking for them to find them. In other words, they are not substantial. This is quite interesting in so far as there is less exaggeration in the degree of weakness over the first half of 2018, but quite a vivid rebound in November before collapsing quite sharply as the year closed. 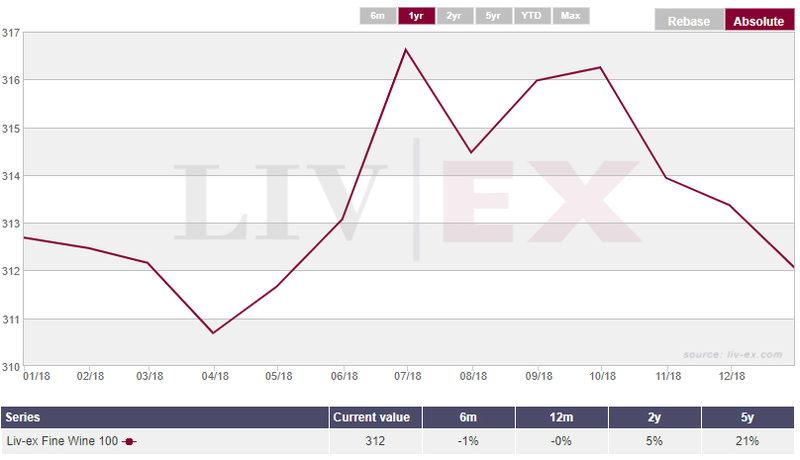 Had there been a close relationship between a weakening Sterling and a strengthening fine wine market we would have seen a much brighter end to the year for the Liv-ex 100. It is almost as if the mid 2016 lurch from 1.45 to 1.30 was the point at which US$ buyers, and remember that a lot of Asian buyers can effectively be classed as US$ denominated, finally decided at that exchange rate that prices were irresistible, thus kick-starting the trend which currently shows little sign of letting up. We have discussed Burgundy many times in the past and there is little doubt that it has been more of a collector’s market than an investor’s hitherto, and even if there is a trickle down in interest from the top names which we are hoping for it will remain challenging from a secondary market perspective. No producers there offer sufficient quantities to generate a great deal of market liquidity. 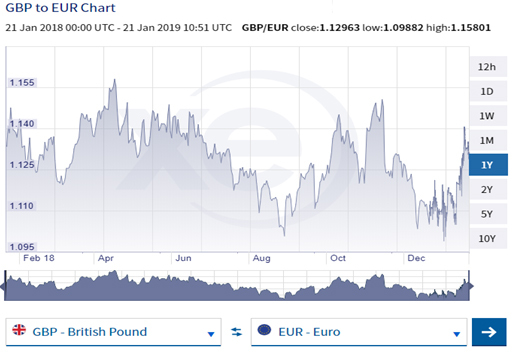 Currency moves seem to us to underlie the market place to the extent that investment returns can either be supercharged by weakening Sterling or delayed as it strengthens, but obviously the unique dynamic of diminishing supply and increasing desirability which are the crucial conditions underpinning rising prices are unaffected. What the Brexit referendum does remind us though is how flexible an investment fine wine is. As an investment house Amphora is politically agnostic but it is plain to see the complications raised by a yes or no vote. For doubtless many additional reasons we now have scant respect shown by Remainers and Leavers to the other side, contributing to the impasse. In investment terms this is almost akin to the decision faced when buying gold. You are either in (albeit there is the question of degree), or you are out. There is no middle ground, no options to afford depth and risk management to your exposure. Imagine if the UK was able to temper its exposure to the EU, to cherry pick those aspects which suited, leaving aside those which don’t. Of course in this case there are 27 different voices and a legal and administrative carapace ensuring that this is perfectly impossible, not to mention warring factions everywhere you look within the UK. “If that is the destination you most definitely don’t want to start from here.” But whatever your starting point as a fine wine investor, whether with an existing portfolio or a blank sheet of paper, you have endless possibilities and the ultimate in flexibility to realise your ambitions. If only Teresa May could say the same.